Sometimes getting a publisher and author to agree on a book’s title seems to take longer than researching and writing the book itself. Shortly after I began work on my Jim Jones/Peoples Temple project in January 2014, I came across one of Lynetta Jones’s poems that included a stanza about her son’s followers being ready to be lifted up because they’d drunk too long from a “bitter cup.” That seemed to me to suggest a perfect title: The Bitter Cup: Jim Jones, Peoples Temple and Jonestown. I told my editor at Simon & Schuster about it, he liked it, too, and until May of this year, that was the title. In May, I flew to New York to meet with my editor and also with Simon & Schuster’s marketing/publicity team assigned to the book. The plan was to select the photos we’d include, and begin mapping out marketing strategy and my publicity tour when the book is published in April 2017. They like to get these things worked out well in advance. I was surprised to learn that the marketing people had another title in mind, taken from a line spoken by Jones on November 18, 1978: Someday Everybody Dies: Jim Jones, Peoples Temple and Jonestown. I didn’t like it as much as The Bitter Cup. The counterargument was that the title needed to be more dramatic. 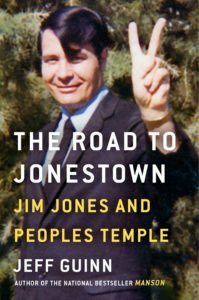 To Simon & Schuster’s credit, the people there listened, so on April 11, 2017, the book The Road to Jonestown: Jim Jones and Peoples Temple will be published. It’s my belief – maybe “hope” would be a better word – that Road indicates the objective telling of a complete story. There’s no going back now; the title’s set, and is already in use in advance press releases, Amazon listing, etc. I can’t say that I like it better than The Bitter Cup, but I’m still satisfied with it, and hope all of you who’ve helped me with this project will be all right with it, too. In trying to tell the story right, every word counts, including those in the title. Originally posted on September 21st, 2016. Last modified on October 19th, 2016.